In our dedication to giving you nothing but the best, we’re presenting the 5 best exfoliators for rosacea. These products were carefully chosen from 15 different brands based on their ability to get rid of dead skin cells, stimulate cellular turnover and reveal a more even skin tone– without triggering flare-ups. TreeActiv Four in One Acne Trea﻿tment can be used as a spot treatment, face wash, exfoliator and mask. It has moisture retaining properties which your skin will surely love. Teva Skin Science Papaya and Honey Exfoliation Mask, meanwhile, uses papaya enzymes and honey to provide gentle exfoliation while moisturizing your sensitive skin. Falls River Soap Honey Oatmeal Soap Bar combines honey and oatmeal. It's handmade with natural ingredients to ensure that your skin stays in its best condition. 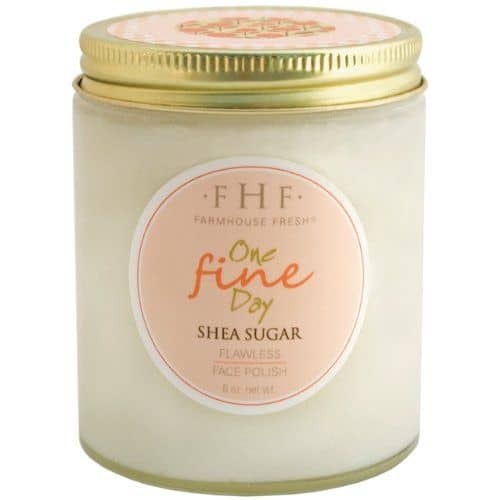 FarmHouse Fresh FarmHouse Fresh One Fine Day Shea Sugar Facial Polish is another product that's made with natural ingredients. It has a nice scent that can help you relax while pampering your skin. Before you raise your eyebrow on this one, let me straighten things up. Yes, it’s an acne treatment, but it’s good for Rosacea, too. How? Since it is a face and body cream, you can feel free to use it wherever you experience skin inflammation, dryness, or pain. Humectant, in case you’re wondering, helps retain moisture in your skin and is considered good for people with Rosacea. On top of moisture, it also helps enhance the penetration of products into your skin. Aside from this ingredients, you’ll also find Aloe Vera juice, witch hazel and grapefruit essential oil in the product. It has honey powder as well which offers antiseptic and antibacterial benefits. You have to add a bit of water into this exfoliator before using it on your face. Since it’s quite easy to overdo and make the product runny, I suggest you start off with small drops of water and add more until you’re able to get the right consistency. It does come with a gritty texture so make sure you use a gentle motion in rubbing it. Did I mention that this is a 4-in-one product? Aside from being an exfoliator, you can also use it as a face wash, mask and spot treatment. Teva Skin Science Papaya and Honey Exfoliation Mask contains honey and botanical extracts to give your skin the deep cleansing it deserves. It has 100% natural ingredients which make it a great choice for Rosacea skin. To start with, you only need a small amount of the product per exfoliation. You can use it two to three times per week, depending on your skin’s response. Since exfoliating rosacea skin can be tricky, I suggest you try the product once a week first and see how your skin will react. Although this exfoliator is made out of natural ingredients, you still need to keep in mind that every skin reacts differently. The product doesn’t have abrasive scrubs for exfoliation. Instead, it has enzymes to break down your dead skin cells while removing free radicals and encouraging skin cell regeneration. Falls River Soap Honey Oatmeal Soap Bar is a bit different from the other products on this list because it comes in form of a soap. But, don’t underestimate its capability to do gentle exfoliation on your rosacea skin (seriously). The product contains oatmeal which can gently exfoliate and provide moisture at the same time. It also has honey that is known for its ability to fight bacteria while soothing irritated and inflamed skin. The best thing about this exfoliating soap is that it’s made from natural ingredients. It’s handmade, too. One thing I have to tell you about this product is that it can turn weepy or rancid if you keep it in a non-ventilated storage. You may also need to keep it away from direct sunlight to make sure its nice colors don’t fade right away. FarmHouse Fresh FarmHouse Fresh One Fine Day Shea Sugar Facial Polish contains 96.5% natural ingredients and is gluten-free. It exfoliates without drying your skin- or triggering your rosacea. The product has a good scent: the fragrance of vanilla, citrus and sugar. It won’t leave your skin feeling tight but it can leave a bit of residue. Aside from exfoliation, you can also use it to de-stress or in pampering yourself after a hard day at work. This sugar polish is great for people with dry and sensitive skin but it may not work as great for people with oily skin. Exfoliation: Is It Safe for Rosacea? The idea of scrubbing or even using exfoliating products on your sensitive skin might make you cringe and that’s understandable. Like, why would you ever rub your skin if it’s already irritated? When you exfoliate, you remove your skin’s topmost layer to help reveal a healthier one. For rosacea skin, however, this turnover happens more frequently than normal- even without exfoliation. This results in dry and flaky skin which are two conditions that would want you to consider exfoliation more. So, what should you do? Simple. Evaluate your skin first. If it’s too sensitive, you should probably trash the whole idea of exfoliating and stick with your gentle facial cleanser. In case your skin is able to tolerate mild exfoliation, make sure to avoid products that contain lots of harsh chemicals, abrasive scrubs and drying ingredients. You should also avoid scrubbing your skin too hard to avoid damaging it and triggering flare-ups. Exfoliation is the process of removing dead skin cells from the surface of your skin. There are tons of ways to do this- well, not if you have super sensitive skin. For rosacea skin, your choices are quite limited. You can’t do too much mechanical exfoliation as it can only trigger your condition more. You can’t also use chemical exfoliation since some chemicals can be too harsh for your skin. One good alternative to these methods is the use of enzymes. It’s a form of chemical exfoliation without strong artificial ingredients and negative effects. Enzymes can help break down the bond that holds your dead skin cells together so that they can easily be removed. They are also able to remove the proteins and other impurities sitting deeply inside your pores. You can get these enzymes from natural ingredients, like papaya and pineapple. You can also find them in yogurt and other fruits. One of the best ways to use enzymes for exfoliation is by using it as a mask. Technically, you have to apply it on your skin and leave it for around 10 to 15 minutes before rinsing off. After use, you should expect a mild or very slight burning sensation. Your face might even turn a bit red. This is a perfectly normal reaction and should not cause any alarm- unless it doesn’t go away quickly. If that is the case or if you see it worsening or if you develop itching and burning pain, rinse it off right away and observe your skin. For this roundup of the best exfoliators for rosacea, we're placing Teva Skin Scie﻿nce Papaya and Honey Exfoliation Mask as our top product. Aside from its enzymes, it also has honey which offers lots of benefits even to sensitive skin. Take note that exfoliation is not always safe for rosacea skin. If you are planning on adding this step to your skin care routine, make sure to assess your skin first or consult your dermatologist for proper advice.